NEWPORT NEWS, Va., June 22, 2015 (GLOBE NEWSWIRE) -- Huntington Ingalls Industries (NYSE:HII) announced today that its Newport News Shipbuilding division has received a $23.8 million contract from the U.S. Navy for nuclear propulsion and complex modernization work on the aircraft carrier USS George H.W. 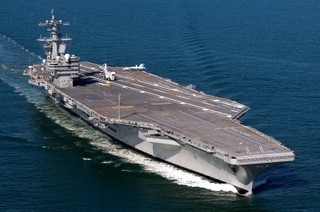 Bush (CVN 77) as part of its planned incremental availability. The contract is for work to be completed between June and November at Norfolk Naval Shipyard and will include planning, procurement, fabrication, execution and testing. "We are eager to begin maintenance and modernization work on USS George H.W. Bush and continue our support of the Navy's aircraft carrier fleet," said Chris Miner, Newport News Shipbuilding's vice president, in-service aircraft carrier programs. "We first delivered the ship in 2009 and have proudly followed her service to the Navy and country since that time. With this maintenance and modernization work, USS George H.W. Bush will continue to serve the Navy for years to come." Named after the 41st president of the United States, USS George H.W. Bush is the 10th and final Nimitz-class aircraft carrier. The ship is home ported at Naval Station Norfolk.